Installing a fence around the perimeter of your home is one of the most successful ways to reduce the chance of burglary. In addition to protecting your home, it also creates a clean and elegant look while providing privacy. Still, many homeowners find themselves torn between purchasing a vinyl or wood fence. It’s important to do your homework before making your fence purchase. We’ve made it easier for you by taking a closer look at how each material measures up in multiple areas. 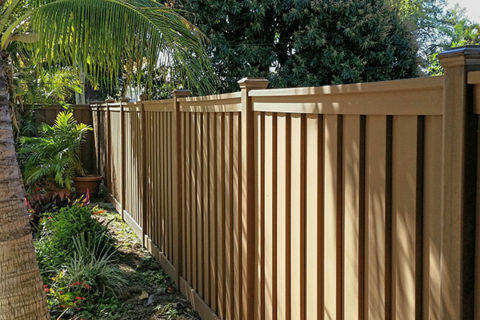 Read on to learn more about these popular fence materials. Many homeowners are surprised to find the number of styles and material options they are presented with when shopping for a new fence. For some, the options can be overwhelming. For this reason, it’s best to narrow down what you’re looking for before shopping. Two of the most widely purchased fence materials in the country are wood and vinyl. Aside from both being popular among homeowners, they are vastly different in practically every area. Here we will break down some of the most important factors to consider when choosing the best fence material for your home. Chances are you have a budget in mind for your upfront cost, meaning the price you will pay for the initial cost of the fence. If not, we highly recommend deciding on one ahead of time. When determining which material has the lower price tag, vinyl tends to be more cost effective due to its manufacturing process and overall material cost. However, you’ll want to take into consideration the type of wood you’re looking for. Some wood species are more expensive then others, so you’ll want to take this decision into account. While many homeowners plan for the short term, initial buying cost, few consider how much will be spent on the fence over time. Like other areas of your home, your fences will require a degree of maintenance. If you don’t plan on doing the maintenance yourself (for tasks like stripping, painting, and staining) you’ll have to pay someone else to do it. You’ll also want to consider the cost of repairs and how often you’ll have to pay to replace the fence. for more information on how these materials measure up in the long run, read on to our “durability” and “lifespan” sections. The last thing you want is to be stuck with an even larger chore list for maintaining your home. Which is why it’s important to consider how much time you’re willing to invest to keep your fence looking like new. When it comes to maintenance, vinyl fences win by a landslide. That’s because wood fences need to periodically be sanded, painted and stained to maintain their “like new” look. Wood fences are also more susceptible to the elements, with a tendency to swell after a great deal of rain or moist weather. Which means more repairs will be needed as well. For many homeowners, going green and taking care of the environment is important. While most fence materials won’t play a large factor in your electricity costs, you may still favor materials that are better for the planet. In this aspect, you’ll want to lean towards vinyl since they don’t require the cutting down of trees. However, if you take into account the manufacturing process of vinyl fences, the two are pretty neck and neck when it comes to carbon footprint. You can also choose to go with a more environmentally conscious manufacturer if it’s important to you. If you’re like most homeowners, one of the most important factors in your decision is the overall look and feel of your fence. After all, in many cases, the fence around your home is the first thing visitors and guests will notice. In this area, it depends on what you’re looking for. Wood has a more classic design that many homeowners favor. While vinyl fences were once only available in white, manufacturers are now producing them in a wide variety of colors. It all depends on your preference. Due to factors like weather, sunlight, and the amount of use you’ll have to periodically replace your fence. The question is how often will you need to pay to have it replaced. Overall, vinyl tends to last twice as long as wood which means you’ll be making fewer trips to the home improvement store. However, it’s important to note that proper maintenance and car can extend the lifespan of your wooden fence. One of the primary functions of your fence is to protect your home, which means they need to be durable and secure. While initially both wood and vinyl serve as strong and secure fence options, over time this may change. Since wood absorbs water, wooden fences have the tendency to swell and in some cases even rot from the inside out. This will occur only if you are not providing the necessary maintenance and repairs. However, once rotting occurs the strength of the fence will be reduced as will it’s security. You want your fence to offer ample privacy for both you and your family. Fortunately, both wood and vinyl fences have their own strengths in this area. Since vinyl doesn’t expand or contract, you can rest easy knowing there won’t be any gaps between fences for peering eyes. Wood also has the ability to blend into its environment, creating almost a camouflage effect that provides privacy for your home. Again, it depends on what you’re looking for and what is most suitable for your homes specific style. When it comes to choosing between a vinyl or wood fence, the most important factor is your own taste and preference. A close second in importance is who you choose to buy your fence from. You want to shop with a company that offers trustworthy service and quality products. If you’re ready to purchase your new fence or simply want to compare pricing, request your free estimate today to get started. 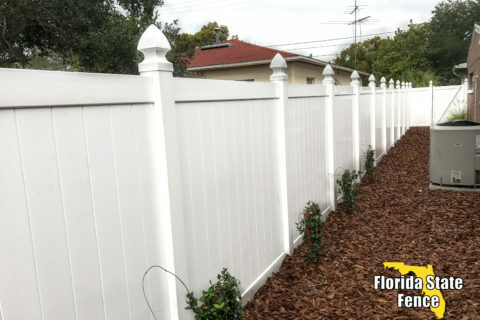 Why choose Trex Fencing over Wood Fence?